Lajon Witherspoon has told Mick Stingley of Billboard that SEVENDUST is "figuring out dates" when he and his bandmates can begin the writing process for the follow-up to last year's "All I See Is War" album. According to the singer, SEVENDUST wrote over 50 songs for "All I See Is War" before entering the studio with producer Michael "Elvis" Baskette (ALTER BRIDGE, TREMONTI, SLASH FEATURING MYLES KENNEDY & THE CONSPIRATORS). "We had so much time off, which was great — we got to go home and be fathers and husbands, and go to the daddy/daughter dances — but when you're away from it for a little bit, the creative juices are just flowing." The band picked 12 songs for the album, but it recorded "a few more than 12. We still have a lot of stuff in the pocket." 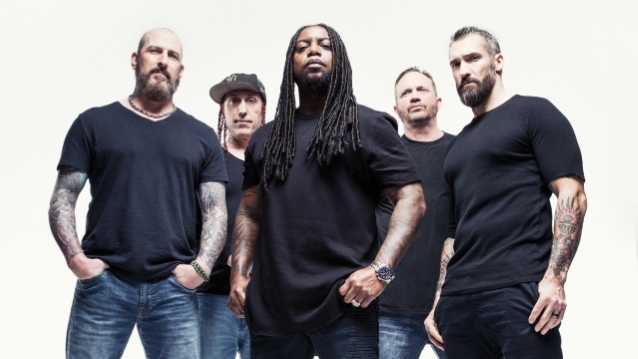 SEVENDUST guitarist Clint Lowery recently told Audio Ink Radio that the band didn't "want to wait a long time" before returning to the studio. "We'll probably end up recording a new record at the end of this year," he said. "We already have ideas kind of floating around for it." "All I See Is War" was released in May 2018. It marked the group's first album for Rise Records, the Oregon-based metal and hard rock label which was purchased by BMG in 2015. So far, SEVENDUST has released four singles and videos from "All I See Is War": "Dirty", "Not Original", "Medicated" and "Risen". "The label has been so great," Witherspoon told Billboard. "They've really been behind the band. We haven't done videos in so long I forgot they still did them. It's been fun for us to be involved and get so many done for this album. It's exciting."